By not making a lot of moves this off season the Giants are making the right moves. Game 1 of the 2013 season is going to look much like Game 1 of the World Series this year. As it stands the exact same outfield and infield will be starters come Opening Day. The only difference will be Cain instead of Zito. Now as a Giant fan the tendency is to fret because it seemed as if the club tried to do exactly the same thing from 2010 to 2011. The difference is that the 2012 Giants didn't need career years from a bunch of players. Pagan may just be hitting his potential, Pence is a solid major league right fielder, the whole infield is young, Scutaro excluded. But he's a vet. Posey won an MVP in his third year. It's not unreasonable to think he will only get better. There's no Aubrey Huff in the bunch. No Pat Burrell, or Edgar Renteria. Cody Ross is not always going to be Babe Ruth. No Juan Uribe to fly those hands through the zone then show us his palms. No more guys that hit a bunch of HR's in career years or redemption years. The 2012 squad is the opposite of that. And that's why it seems Sabes wants to follow the same blueprint from this year's model. 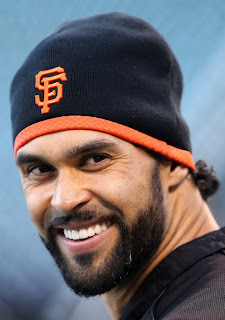 Angel Pagan for 4 years and $40 mil looks like a steal after Victorino got 3/$39. 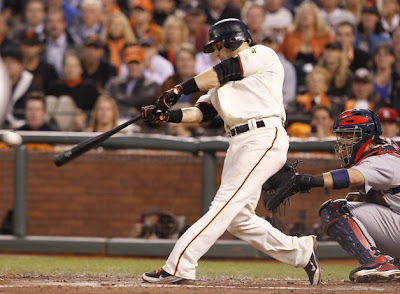 Scutaro got the third year he wanted from the Giants. But tell me, would you not want a veteran Marco Scutaro coming off your bench in 2015? Even Pagan as a 4th outfielder makes sense towards the end of his deal. The Giants are not paying frauds that proved their worth in other parks. They are paying the guys that can get it done in the ballpark that is built for them. Starting Pitching is set. We all know that. We need a bounce back year from Timmy. In the bullpen I am totally ok with letting Brian Wilson go. At $6.8 mil he was just too much of an unknown. He has had 2 Tommy John surgeries and the Giants do not have the best luck rehabbing closers. So let it be a fight for the job, which I expect Sergio will win. Brian Sabean and Bruce Bochy have this team in place the way they want. If starting pitching stays healthy there is no reason the Giants won't contend for a title again next year. Sabean does make moves mid season and I am curious to see what they can do next year. If the Giants have a hole, he will try to fill it. 69 days until Pitchers & Catchers report.